So some people *cough*tekla*cough* have been bugging me why I'm not uploading my Dubai pictures. I thought it wouldn't be necessary cuz I already made an entry (last 22nd)... but she mentioned that I could turn this blog into a 'travel blog'... and early this morning while searching for itineraries to NYC... I found interesting travel blogs and I was somehow persuaded to do the same. So, here I am... rewriting and uploading my Dubai Adventure. As planned, my sister May who's working in Dubai gave us (Mama, Me and younger sis Ola) a ticket to visit her. It's like her graduation gift to Ola, since she just graduated from college and also since May's birthday is coming up, she wants us to be there. May 12th: We left Batangas early, around 6am.... Our flight isn't until 2:30pm... but we've decided we're gonna commute/ride the bus/drag our luggages around so we better be early. Compared to hiring a van which would cost about Php3000, we spend a little less than 900 for the three of us. That includes tricycle, bus (we rented 1 seat for our 3 luggages), bottled water and taxi (to airport)... we're on a BUDGET TRAVEL... ha! We had a stop-over at Bangkok Airport... then transferred to the next Thai Airways Airbus heading for Dubai. We arrived in Dubai International Airport at 10pm, coming from an air-conditioned airport, we were welcomed with 40 degree weather outside. I seriously thought there was a heater on, or we were just near a generator or some machine generating heat. As soon as May arrived to pick us up, we were asking for "WATER!!!!" We arrived at Gardens Apartments... and what do you usually do when you see a big comfy bed? Yep, you jump on it!!! May 13th: Woke up early, I guess all of us were too excited. Had photo-shoots at the apartment. After debating over different plans, we decided to hit Wild Wadi to beat the heat! Swimming, Wild Rides, More Photo-shoots! Foods!!!! Icecream!!! Milkshakes! .... it was so much fun. After rinsing off, we left at around 3:30pm, so we can change outfit for our next destination...Bab Al Shams Desert Resort and Spa. Hired a taxi which took about an hour and 106Dhms to get there. We toured Bab Al Shams, then had dinner at Al Hadheerah. It's an open-air restaurant and you have bellydancers, the rotating dancer and some Lebanese performers while you're dining in. My mama had so much fun when the dancers pulled her up the stage and she danced with them! We were laughing out with embarrassment. Then after dinner, we went out back where there were camels and we were able to ride one for FREE!!! wooooo!!! May 14: I woke up late and sick, I think it's because I had too much icecream and dessert. tsk tsk... I stayed in bed all day. Which was working out fine since May is also at work. We don't have a tour guide. Heh! She had to attend an event for work, they're awarding exceptional employees (including my sister) at Burj Al Arab. She's only allowed one guest, so she brought Mama with her. Ola and I were left at the apartment to sleep, internet, watch videos, and sleep some more. Oh yeah, that's me doing the most sleep. They brought me medicine and I slept some more. Hahaha! Later in the evening, I was feeling better so we strolled in Battuta Mall. May 15: It's May's Birthday!!! But she was once again at work... later when she arrived, we went to Battuta Mall for some grocery. The temperature was bearable so we walked from the apartment to the mall. We couldn't resist and got side-tracked when we saw Mcdonald's.... we have to order! ^_^ We got home and there were already guests there... and then the party started.. more guests.. more pictures... more foods.. more guests... and some more pictures! May 16: Woke up late, then we had brunch and tour of Jumeirah Emirates Tower. Food was amazing, that didn't stop me from eating 3 flavors of icrecream again! lol. and I ate more dessert than the main course. teehee!!! by 4:30pm, we were ready to leave the hotel for some Arabian Adventure! Desert Safari with the stomach-churning dune driving, more camel-viewing, more photo-shots, and then another bellydancing. We had some henna tattoo done... and then dinner was served under the starry sky. May 17: Went to Dubai Museum, learned some of Dubai's history; then strolled around Festival City; went gold-shopping at Gold Souk (I didn't buy one, my mom did. She basically wants to live there...); then on our way home we rode the regular bus... which was quite a tour for such a cheap price. This bus would stop at basically EACH and EVERY stop. And as my sister said, it's a 'scented tour' compare to the very expensive taxi that doesn't offer that smelly experience. May 18: Did some shopping at Emirates Mall, bought gifts and "pasalubong" for siblings and etc. ; Finally we went to Madinat Souk, then went to a bar...and had some drinks and some shisha.... I just tried it once... I think the apple powder got to my lungs soooo.... I started coughing and never tried it again. Instead I enjoyed my martini. Heh! May 19: Did the laundry, did some packing... and we were ready to leave... but not before hitting Dubai Duty Free, and buying lots of dates and Patchi chocolates! Yum. May 20: Finally back home!!! We arrived in the city around 5pm. Until the next adventure!!! Ooohhh... I'm going to New York City this coming Monday!!!! Wooooooohooo!!! Who's excited? I'm excited! Nyahahaha!!! I was bored at home one night... so I started typing something out.... here's what I came up with. Tila yata naubos na ang mga salita’t talinhaga. Mumunting alay sa irog, animo’y biglang naglaho. O ang sakit ang nagtakot, para ito’y iwasan na? Hindi man ninais, iwasan ang wikang gamit. Sa wikang ito, napagmasdan ang ngiti mo. Sa aking munting tula, tila ika’y napaamo. Hatid ng pusong halos mabaliw sa iyo? Dios mio, tunay nga kayang pag-ibig na ito? Hindi alintala kutya at halakhak ng iyong barkada. If you want to use this piece--either in full or part--please let me know and give proper credit to the author. Better yet, link back to this blog. I guess it's gonna be awhile again until I post my next update... why, you'd ask? Because I'd be on my week long vacation starting tomorrow!!!! Woooo!!! where to? Oh, not that far away... just Dubai. Mooohahahaha! Ahhhh... Nooo!!!! Happy thoughts, think of happy thoughts... I'm thinking of a happy thought.. Doraemon! happy thoughts... happy thoughts..
Eto na nga lang...Sabay-sabay! "We do it like you do it.. we do it like you do it at Burger King! We do it like you would do it.. we do it like you do it at Burger King! Burger King!" Man, I love that song! that's why I love dining in that place. By the way, you're probably wondering why this is titled "Yesterday." It's because that song by the Beatles is playing over and over in my mind while typing this quick update... "yesterday, love was just an easy game to play.. now i need a place to hide away..."
So you see my brain is pretty messed up right now.. it's remixing four songs as I write. Weird eh? Ta ta for now! I'm off to ride the camels! I've found this old poem... I think I wrote it.. lol. But I can't remember what's my inspiration. The only reason I do believe it's mine is cuz it's in this blog's draft entries dating back from November of 2007. Haha! When I almost had you in my arms. No more hearts that need to mend. Like we've known each other for long. But in my brain, my feelings wrestle. To the what-ifs, that i'll never know. How i wish it was easy to forget you. I tried too hard, you should know. Even until now, it's hard to let go. When i almost called you mine. 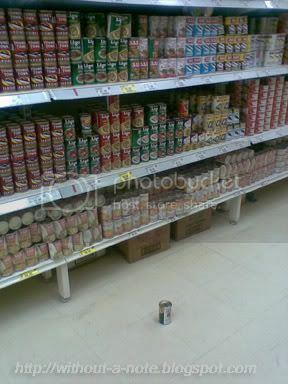 A few days ago, I was doing my grocery and when I came across this aisle, what I saw made me laughed out loud. I’m sorry for the things I’ve done and the things I failed to do. I thought we were okay, but I never really had a clue. Maybe I just don’t show it as much as you want me to. I don’t know how to act, or the right words to say…. I need you to help me… figure out what you want from me. I’ve promised myself that I’ll never hurt you, but time and again, that’s all I ever do. This sharp pain I’m feeling, each time we’re fighting. But each dagger you push through me, is another barricade for me to build. Teach me how to be the person you could love; help me make it right. Please pull me out from this misery, or forever let me be. For I cannot take another heartache, I can no longer play the charade.